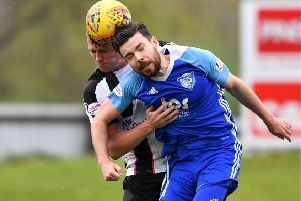 Peterhead manager Jim McInally was “delighted” with his side’s 6-2 thrashing of League Two leaders Montrose at Links Park. The Blue Toon were 2-1 up at the break thanks to a Jason Brown double, and second half goals from Alan Smith, Mason Robertson, Willie Gibson and Rory McAllister rounded off the hammering. Elgin City boss Gavin Price was at Links Park for the match, as his Elgin side prepare to travel to Balmoor Stadium on Tuesday. Peterhead will aim to make it 10 wins out of 11, but McInally knows it won’t be easy: “Their game was off today, so they are coming in fresh. Midfielder Willie Gibson grabbed a goal and two assists with fantastic delivery, and was playing through sickness. On the free-kick he scored, Gibson revealed he got inside info from goalkeeper Greg Fleming about his brother, Allan, who was in goals for Montrose: “I was speaking to Flem, and it was his brother in goal for Montrose. He said to have a look at his positioning, because sometimes he takes a step behind the wall.